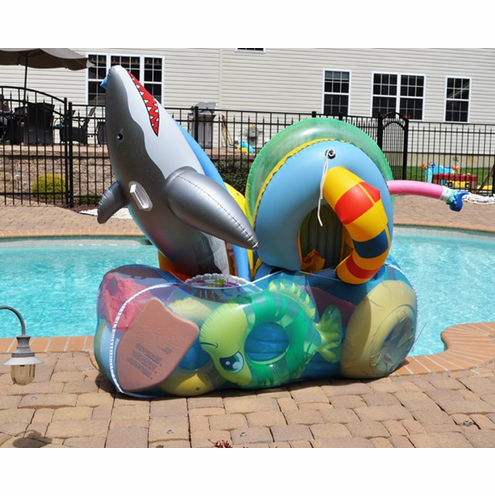 The Pool Pouch stores all pool, patio & backyard toys & accessories! •Convenient and practical --- great for the pool, the beach, the park, the second or vacation home or anywhere fun and practical stuff must be carried and brought to. •An organizer that easily stores all pool, patio and backyard accessories, small toys, beach balls, inflatable rafts, etc. •Conveniently hangs on the side of solid side pools, walls, fences, gates, etc. •Unfolds & expands to amazing volume. •Well made, scientifically engineered and extremely durable.